OM Arts International: Arts Team Connects to Community in Belgium. International missions trips for performing, technical and visual artists! 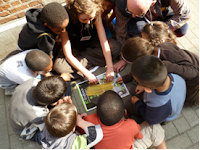 Arts Team Connects to Community in Belgium. Four young missionaries serving with Operation Mobilization (OM) in Belgium met as a 'visual arts team' in May, 2011 along with a team of creative students from Colombia International University in the USA. Their goal was to participate in the team's first street art evangelistic outreach. These musicians, visual artists and actors spent their first week working in Brussels with a church group who holds their gatherings throughout the city in local cafes. Their days involved praying and creating art that expresses the area, as well as community pieces of art involving local participation. Evenings brought interactive worship events in local cafes and prayer for the area. One of these events planned was in the Marolles neighborhood that OM has been working in with the hope of starting a church. The team then moved on to Leuven to do similar things but with the goal of generating interest in their new art club that aims to help Christians and non-Christians meet together on a regular basis. From this club they plan to start Alpha courses based around the artistic themes. Even though this creative arts team finished their outreach, there will be another arts missions trip to Belgium in December. Consider being a part of this exciting Christmas arts missions trip for performing, technical and visual artists! Excelling in arts in missions. imagine - illuminate - impact! It is so encouraging to see what God is doing in and through the Arts! Praise Him for sending these wonderful people to a place like Belgium, which desperately needs to "see" the Gospel in action!!! O.M. Arts School of Mission Scheduled to Open in Italy! International Short-Term Missions Trips for Artists! Bill Drake Band Rocks Hungary.